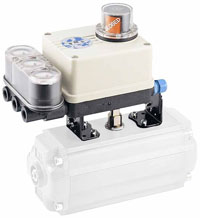 Pneumatic positioners require an input signal of 3-15 psi for proportional control actuator. The Positioner compares the output signal from a controller with the position feedback, and varies a pneumatic output signal to the actuator accordingly. High capacíty, compact design, low maintenance, action reversible. Position transmitter and limit swítches are available. We supply a full range of Pneumatic Instruments including DP transmitters, Valves, Positioners, Recorders... Visit our Pneumatic Instruments page for more!